It’s now looking very likely that the Nokia 9 will push this crazy smartphone world we now live in... and be a camera that has five camera lenses on the back. While some earlier leaks pointed to fewer sensors on the rear of the 9, recent hints have all suggested a penta-lens setup, and now we’re seeing that yet again in some case renders. Shared by SlashLeaks, the renders show seven circular cut-outs on the back, but one of these is expected to be for a flash and one for a sensor of some kind – likely a phase detection autofocus (PDAF). Other details include two buttons on the right edge, which are probably for the power and volume, a cut-out for a microphone on the top edge, and more holes for what’s likely two speakers and a USB-C port on the bottom edge. The images match up with detailed renders of the Nokia 9 itself that we saw recently, so they may well be accurate. Then again, case makers will often create renders themselves based on leaks. There’s no other information in today’s information but based on previous rumors the Nokia 9 could have a 5.9-inch screen, a metal frame, a glass back, a 3,800mAh battery and an in-screen fingerprint scanner. 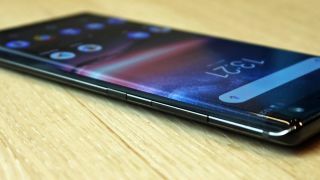 We should hear more about the Nokia 9 soon, as the most recent release date rumors put its announcement at MWC 2019 in late February.